Allow me to guide you on a visit to one of my favorite places on the Florida Pirate Coast (aka the Gulf of Mexico coast.) Just a short half-hour drive from my house, on the southern tip of Gasparilla Island, one of the many barrier islands that protect Florida’s shores, sits a small town with a big history. 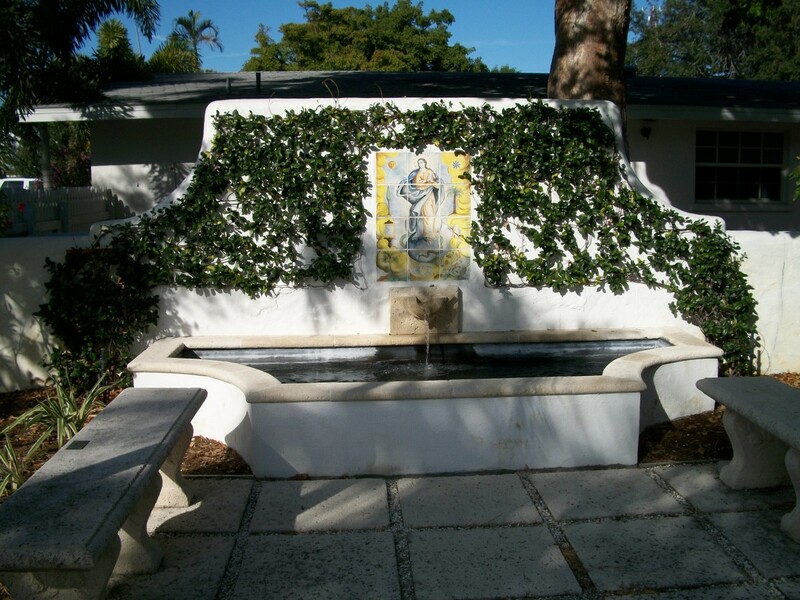 Come and enjoy the present and past of Boca Grande. I was told, but have not been able to confirm by written records, the small island you see to the south of Cayo Costa, called Captiva Island is so named because it was once a favored spot for pirates to maroon captives held for ransom. Boca Grande (see the 'you are here' on the map) sits on the main entrance -- the mouth -- to Charlotte Harbor hence the name, 'Big Mouth' and during the heyday of phosphate shipping, commercial fishing and trade in the Gulf, the town became an important port. You'll note the two main rivers flowing into the harbor itself: Myakka River and Peace River, and the third major river, Caloosahatchi River, to the south, flowing into Matlacha Pass and up into the 'mouth.' These three rivers all crowding through the same outlet between Gasparilla and Cayo Costa Islands create some of the most treacherous currents to be found on the Pirate Coast. 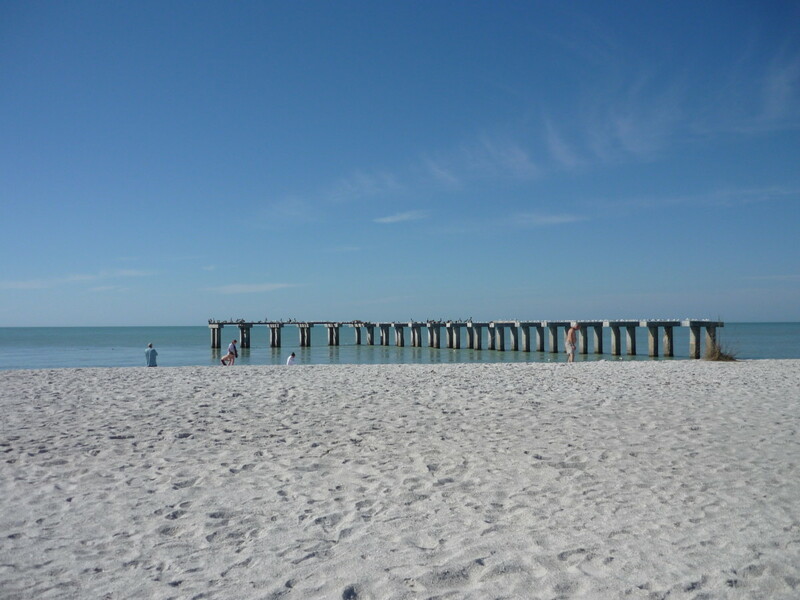 Swimming is not a good idea off the southern tip of Gasparilla, and best saved for further north, off the beaches of the village of Boca Grande itself. 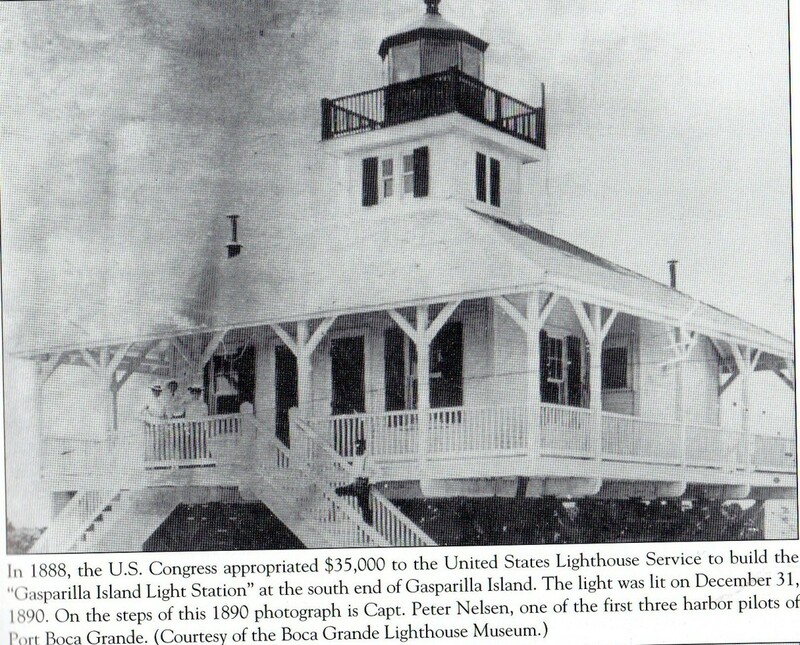 The difficulties of these waters, and the heavy marine traffic necessitated the building of a lighthouse and in 1890 the Boca Grande lighthouse was built, perched on the south most lip of land, overlooking the deep waters of Boca Grande Pass, and guided ships from twenty countries into the safe haven of Charlotte Harbor for sixty-seven years. The keeper and his assistant kept the 3.5-order Fresnel lens lit, first by kerosene lamps, later by oil, and ensured the light revolved 24 hours, seven days a week. Decommission in 1957, the lighthouse was allowed to decay for decades, and was nearly destroyed, but became a museum in 1990, and we're going over there to look around. Beautiful day to visit the island, and this fascinating museum. The decommissioned lighthouse fell into ruin. By the 1960s the building sat at a tilt, foundations undermined along with the shoreline's deterioration. (A situation common to many of the state's beaches at this time.) The stairs rotted away; the building grew more dilapidated with each passing year; the water rose up the shore until the old lighthouse stood completely surrounded. 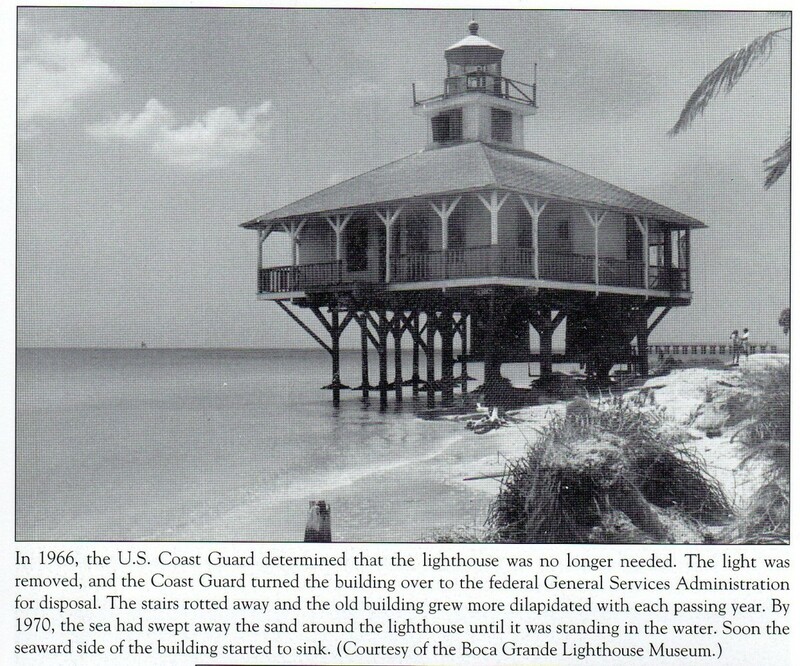 In 1966 the U.S. Coast Guard determined the lighthouse was no longer needed and the structure was officially abandoned. The seaward side of the building began to sink. 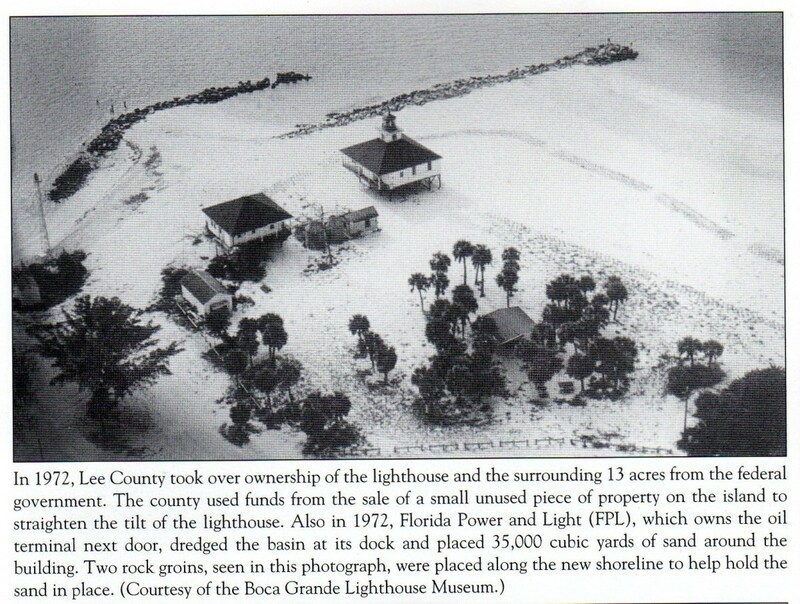 In 1972, Lee County took over ownership of the lighthouse and the surrounding 13 acres from the federal government. The county used the funds from the sale of an unused piece of property on the island to save and refurbish the historical site. Florida Power and Light (FPL) dredged the basin of the dock and brought in 35,000 cubic yards of sand to rebuild the shoreline. Two rock groins (seen in the photograph) anchored the sand in place. The lighthouse was placed on the National Register of Historic Places in 1980, but the building itself continued to deteriorate. In 1985, a movement started by the citizens of Boca Grande set off the events leading to the replacement of the lens, the re-commissioning of the lighthouse by the Coastguard in 1986, the take over by the State of Florida in 1988 and the restoration of the building. 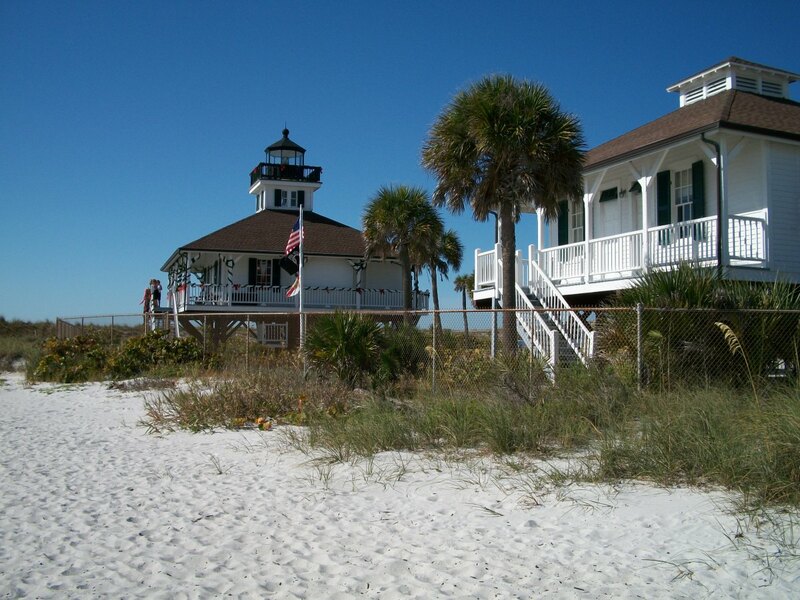 Today, the Boca Grande lighthouse is the center of the Gasparilla Island State Park and is maintained as a museum by the Barrier Islands Parks Society. This living piece of Florida history came precariously close to complete destruction, but was renewed and preserved by a remarkable effort of government, citizens and businesses working together. Let's go inside. There's no entrance fee, though donations are requested. The museum tracks human history on Gasparilla Island and Boca Grande from the earliest known human inhabitants, and gives much information on the Calusa people. The first thing you see on entering is the mural pictured below, depicting the near ideal life these people lived in this land of plenty. They fished, hunted, cultivated fruits and vegetables, gathered wild foodstocks, built canals, homes, villages and burial mounds. As the mural says, they lived in harmony with their environment. Their 10,000 year lifestyle was about to come to an abrupt end. According to "The Lost Empires of the New World," the first arrival of Europeans began the annihilation of the indigenous nations of the Americas within a decade. Contrary to popular myth, the native peoples lived in organized nations as diverse in language and culture as Europe and industrious -- building towns, farms, orchards, canals, traveling and conducting commerce. The Old World diseases spread before the invading forces, decimating the population and destroying the native civilization. By the time Europeans traveled beyond the coastal areas, between 60 - 85% of the indigenous populations had already succumbed to disease. 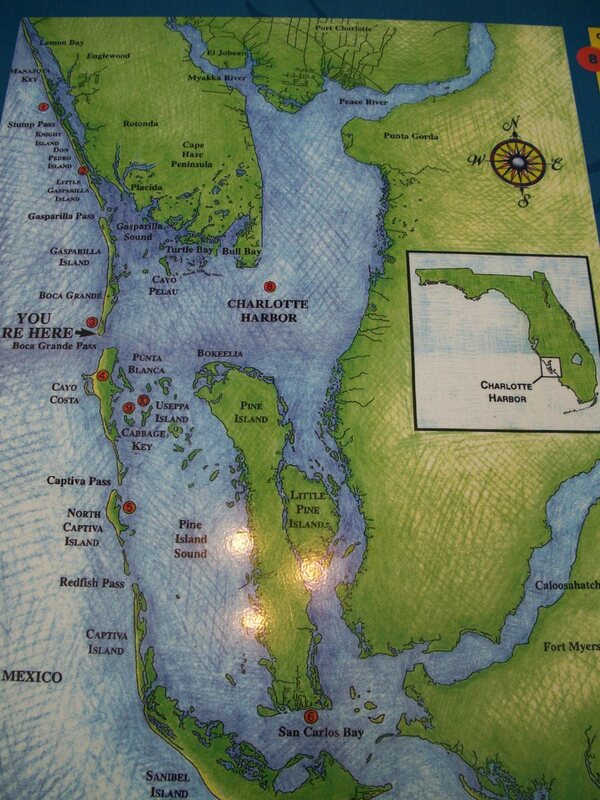 In 1492 Columbus sailed the ocean blue, but when the first Europeans came to Charlotte Harbor is uncertain. 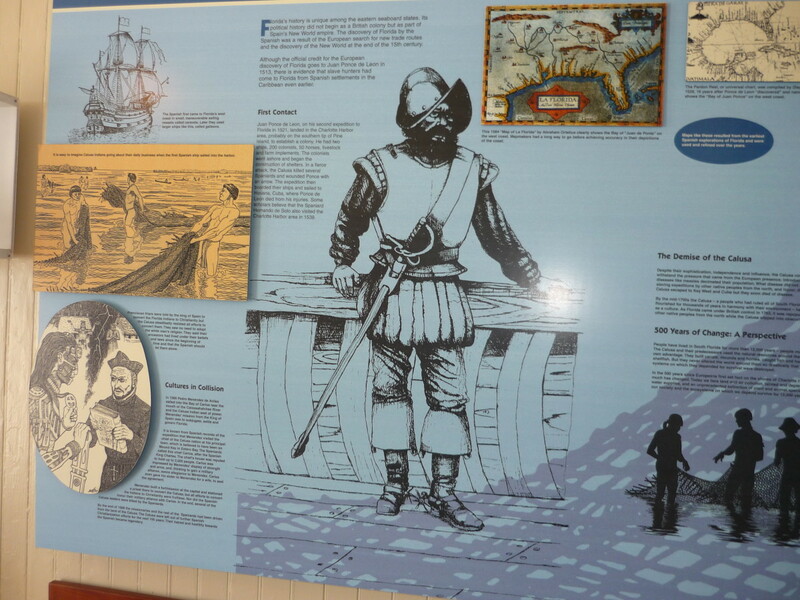 We do know Ponce de Leon set forth up the west coast of Florida in 1513. Upon his arrival at modern day Boca Grande, he noted he and his men were greeted by native people shouting in Spanish, though the hows and whys of such a greeting are "one of God's mysteries." (Apparently it didn't occur to Senor de Leon the indigenous nations traded, traveled and communicated with each other.) However, along with this new language, the newcomers also brought measles, chicken pox, smallpox, tuberculosis and scarlet fever, to which the Calusa had no resistance . In the end, the Calusa died off; the attempted colonies failed; and Boca Grande's first settlers were Cubans who built seasonal camps in order to service the fishing fleets working these waters, ranging further north to feed the hungry mouths of the great Spanish empire to the south. 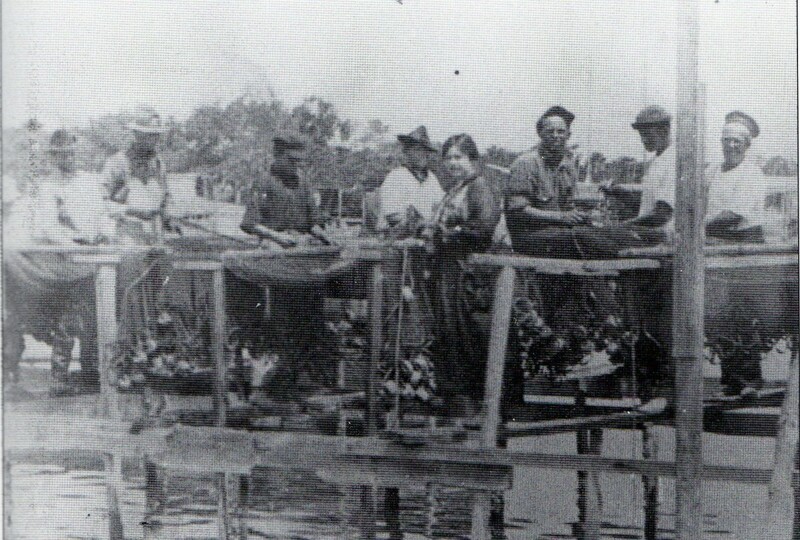 By the 1700's the shallow fishing grounds of the Caribbean islands and Cuba were being depleted of edible marine resources and the rich fishing grounds of Charlotte Harbor gained new importance. The earliest permanent settlements in the area were Cuban fishermen. 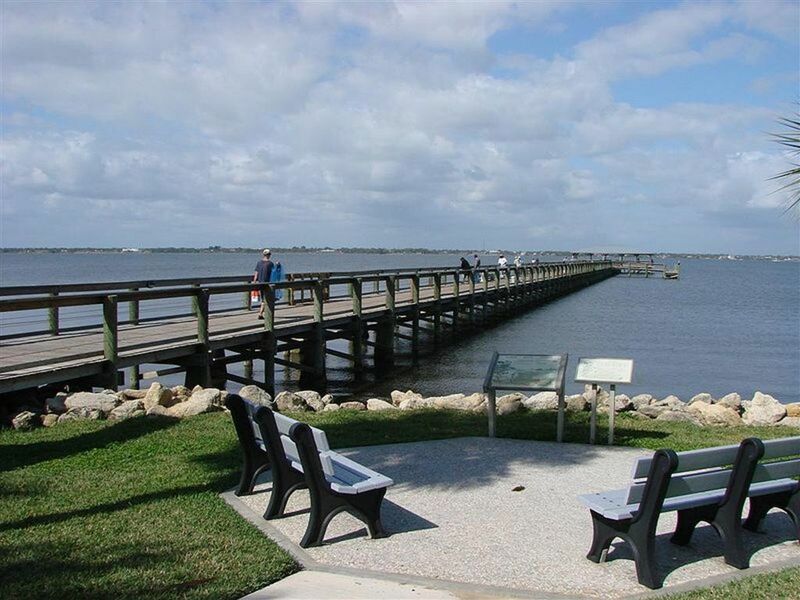 In 1845, when Florida became the 27th state, accounts of the day report up to 600 men, women and children worked in a dozen or so fishing "ranchos" around Charlotte Harbor and one of these permanent sites was to become Boca Grande. 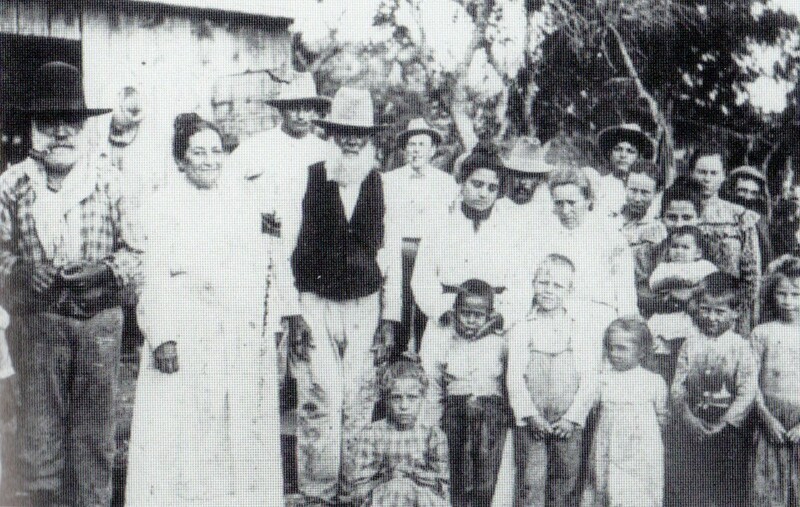 Inhabitants of a fishing village in 1889. 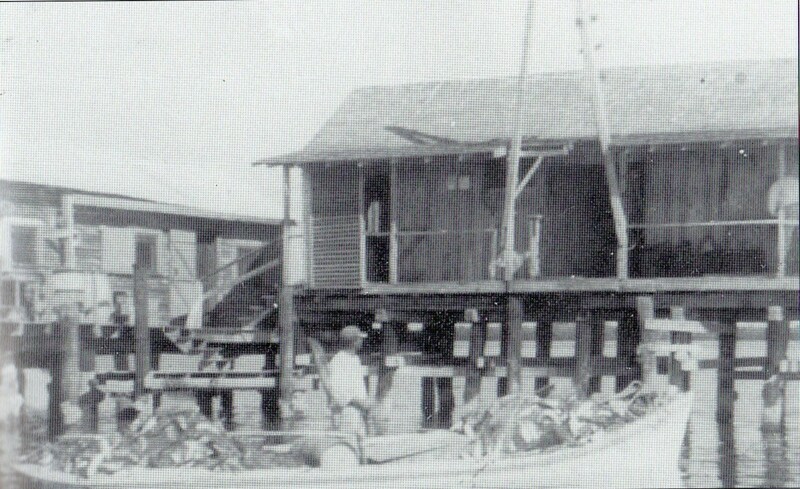 In 1886, the nature of fishing operations was transformed by the construction of an ice factory in Punta Gorda (a harbor town on the mainland) and the extension of the Florida Southern Railway to the Punta Gorda docks. By the early 1900s the family run fishing ranchos were supplying large fishing companies with catch, delivering the fish and loading up with fresh ice at the dock and returning to the waters. No more dried fish to cure and market; fresh fish, packed in ice and loaded on to insulated rail cars now supplied much of the Eastern United States. 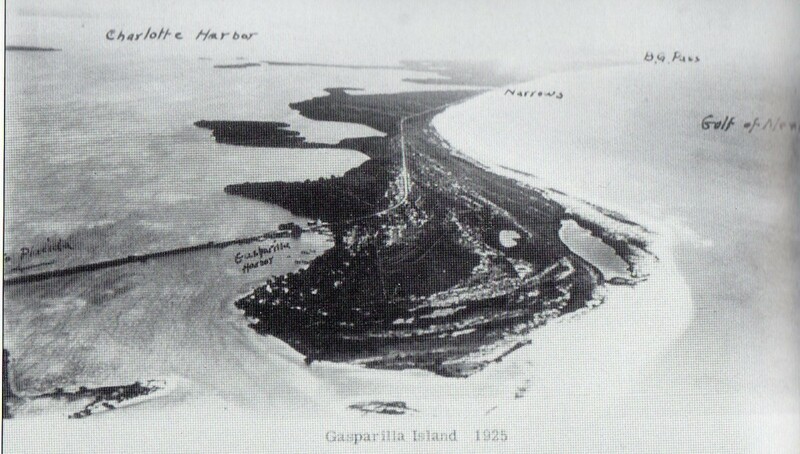 In 1881, a new discovery affected Gasparilla Island irrevocably. Huge deposits of phosphate, in great demand worldwide for the manufacture of fertilizers, were found in the Peace River basin on the mainland. Once the phospate was mined, washed, sorted and ground, it was transported by rail to the Gulf of Mexico, where it was loaded onto barges, carried across Charlotte Harbor and transferred to ocean going vessels in the deep waters of Boca Grande Pass -- an inefficient and tedious method. In 1904, the Bradley family of Boston, owners of the Bradley Fertilizer Works decided to build a rail line from the phosphate mines in the interior of the Florida peninsula to the southern tip of Gasparilla Island where ocean vessels found deep enough draught to dock, and in February 1905 the work began. Boca Grande phosphate dock, Circa 1915, is a massive conveyor belt. 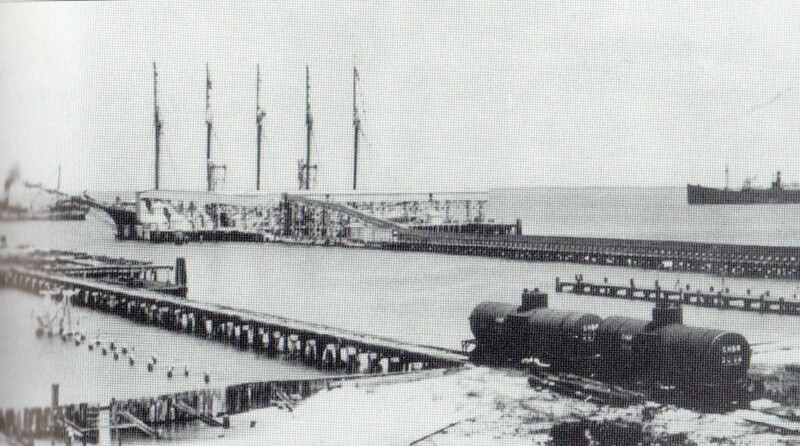 The phosphate is unloaded at the railhead and carried by the belt to the ship. Note the ship being loaded is a five masted "Yankee Schooner," replaced by steamships by the 1920s. 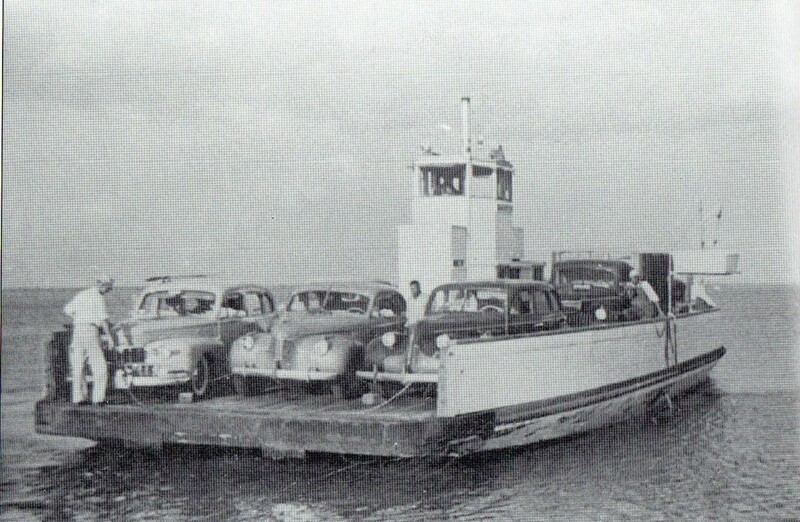 Ferry service to Gasparilla Island in 1950. Cars were loaded aboard and transported for $5. This 1925 aerial view shows the railroad causeway leading to the north end of the island, heading south. In 1925 the north section is still wilderness. The 1.7 mil Boca Grande Causeway and it's swing bridge for boats traveling the Intracoastal Waterway was built in 1957-58, allowing automobile traffic direct from the mainland at Placida to Gasparilla Island. Transportation to a barrier island has changed over the years. 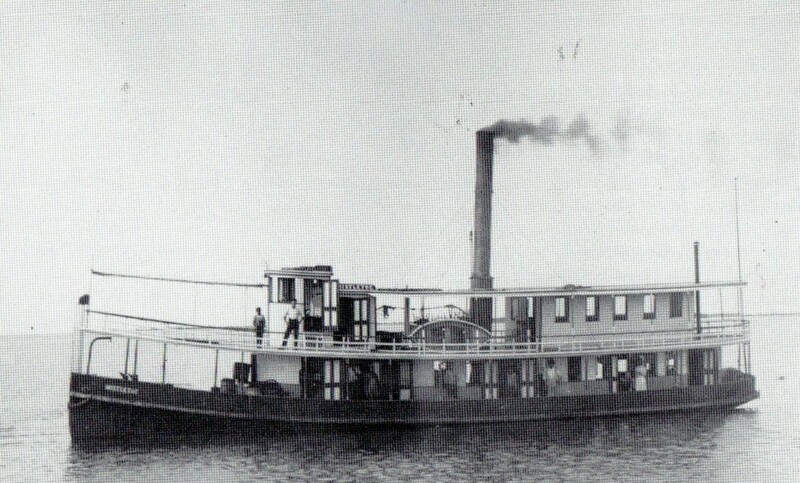 Prior to the early twentieth century, one needed a boat. Early visitors could take passage on ships, first of the wind driven variety, later steamships, which did a 'mail run' service to the various communities of the islands.Pictured to the right is the steamship Mistletoe which serviced the area for thirty years. But the traveler desirous of visiting Boca Grande itself in the early part of the twentieth century either required a private boat, or spent days on the steamship stopping at every port and community along the way. 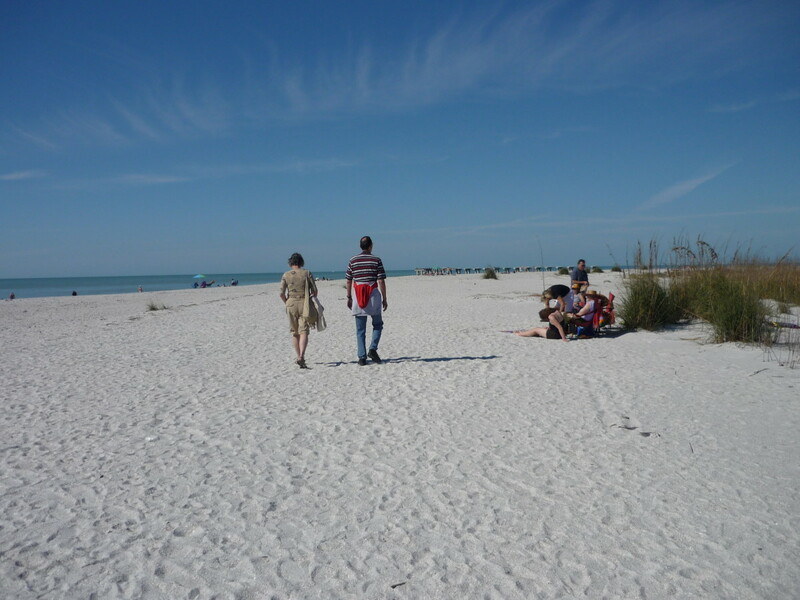 The arrival of the railroad changed the status of Gasparilla Island and Boca Grande forever. Now, visitors had a direct route, and they came in droves. This was the beginning of Boca Grande's third great industry -- tourism. Investors saw a good thing on this island, and began building for an anticipated tourist trade, creating the luxurious hotels of the day, and the streets and grounds of the modest fishing village were gentrified, prettified, planted and groomed. Service industries abounded -- restaurants, shops, cafes and bars, saloons and brothels, all the necessities of a port town. 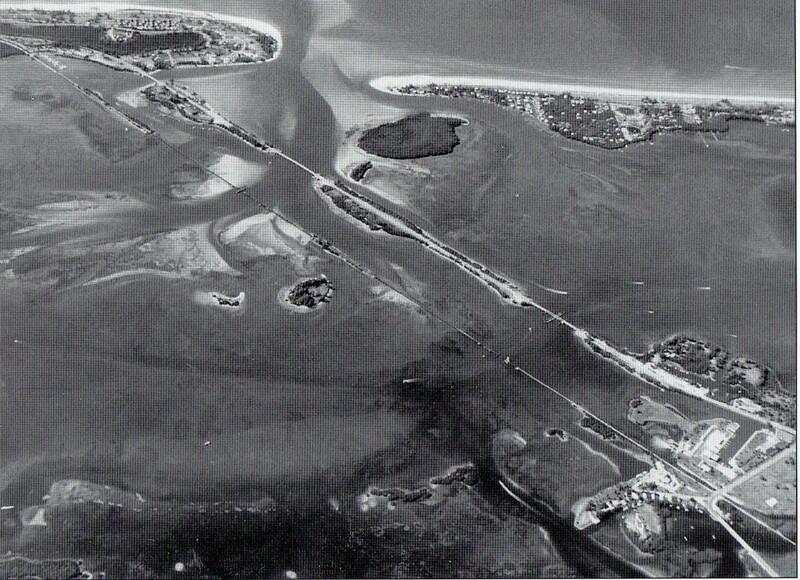 In 1957 construction began on a cause way linking the mainland at Placida to the island, and automobile travelers no longer had to count on the ferry service, which was discontinued in 1960. 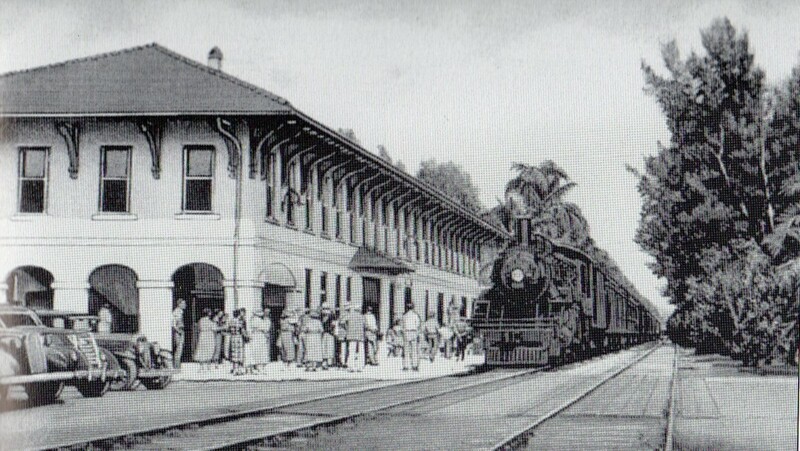 The railroad discontinued passenger service in 1958. Water traffic reached its zenith in the 1960s, when Florida Power and Light built its own dock and oil storage facility in 1958. Now Boca Grande was a two terminal port, and 250 ships a year from all over the world visited the the village to shop, eat, drink and relax. But what was it that drew visitors to this small island and modest village? The whole craze started on March 12, 1885, when a New York sports fisherman, Mr. W.H. Wood, caught a 93-pound tarpon on rod and reel at the mouth of the Caloosahatchee River. His feat captured wide media attention and sparked off a new sport -- tarpon fishing. Each spring, tens of thousands of these giant fish, known as 'silver kings' due to their sparkling scales, migrate into Boca Grande Pass and stay for around three months. They come to the area to feast on crabs and other food swept in and out on the daily tides, preparing for their offshore spawning season. That next year, the railroad had reached Punta Gorda on the mainland east shore of Charlotte Harbor allowing well-to-do anglers from everywhere to arrive, anxious to hook one of these giants. The descendants of the commercial fishermen who had pioneered the area became guides to these wealthy parties. It became an international phenomenon. And almost did in the tarpon. Thousands of fish were caught killed and displayed sometimes by the dozens per angler, for picture taking. Tarpon are not a food fish, primitive in design, oily and full of bone. They were caught, killed and discarded. 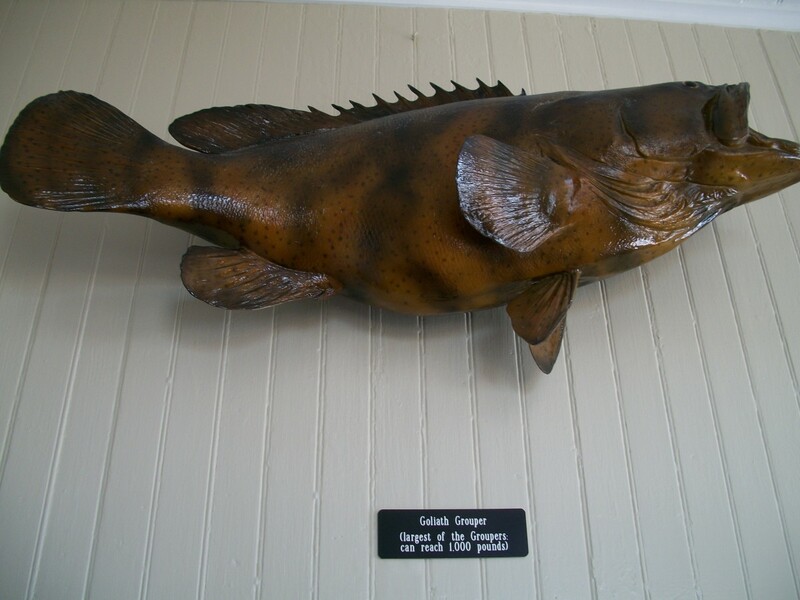 Grouper: one of my personal favorites. Dolphin fish: light, delicate meat and I'm told he puts up a good fight. 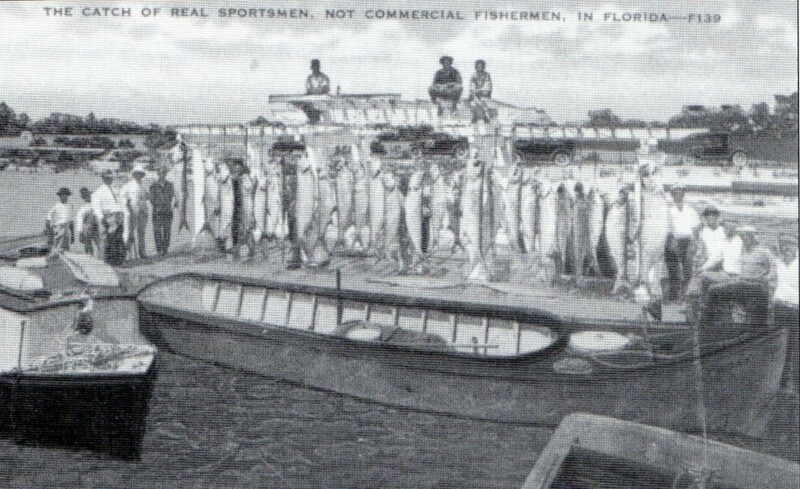 By 1920, the "catch and release" concept of fishing was instituted by those fearful of the demise of the species, and lucky for the fish, the idea caught on. Today, tarpon fishing is highly regulated, and almost all tarpon caught in Boca Grand Pass are released. Once again, fishing became a major industry for Boca Grande, and today is a multi-million dollar business on the island. The largest tarpon ever recorded in Boca Grande Pass, caught in 1983, weighed 234 pounds. The Florida record is 243 pounds and world record is 283 pounds. 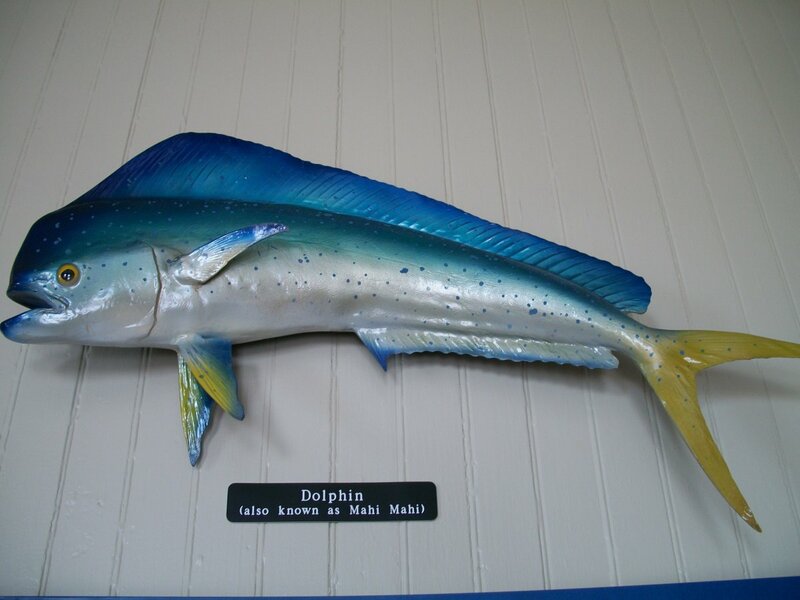 But other sport fish are now equally sought in the Charlote harbor area: redfish, trout, pompano, grouper and dolphin fish. 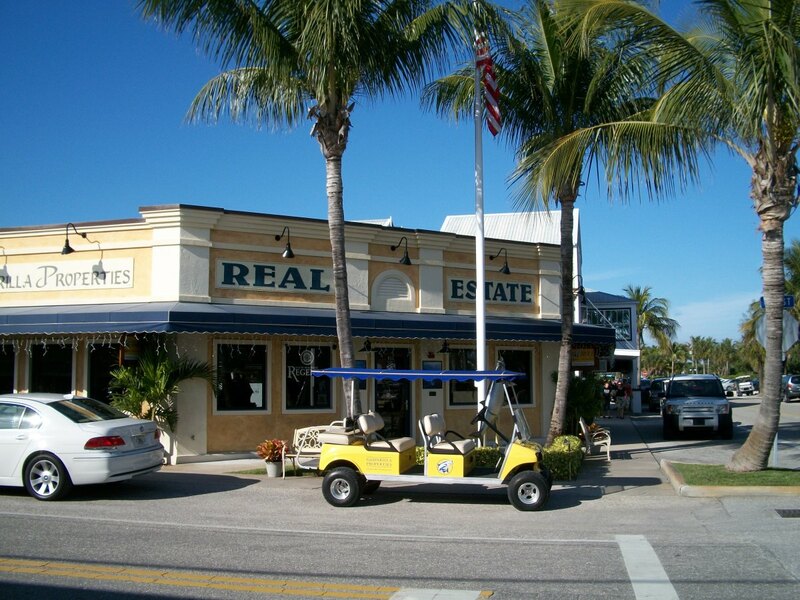 Slowly the focus of Boca Grande's financial life changed. In 1979 the last load of phosphate left the port and the dock facility was closed, and later destroyed, though the skeletons can still be seen, now roosts for pelicans. The trains stopped running that same year. Florida Light and Power closed the oil storage facility and the second commercial dock in 2001, after 43 years of receiving oil-laden tankers and barges from across the Gulf of Mexico. The most luxurious hotel in town, The Hotel Boca Grand, fell victim to a massive fire, and the remains were leveled by the wrecking ball in 1972. 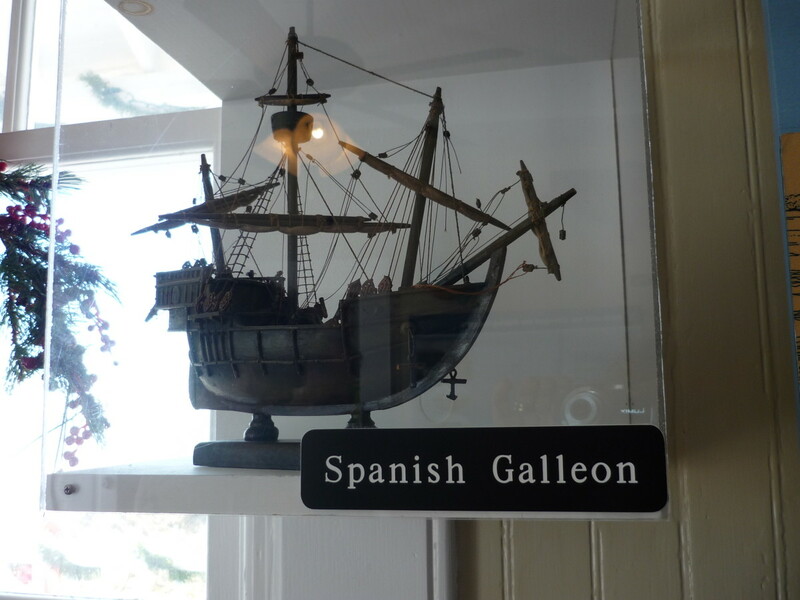 The Gasparilla Inn is still in business and caring for visitors as it has since 1911. The bathhouse on the main beach fell victim first, to a hurricane in 1921. Then, the rebuilt structure was destroyed by another in 1944. Finally, the latest --- a plain box affair with change rooms and showers was swept away by the storm surge caused by Hurricane Charlie in 2001. 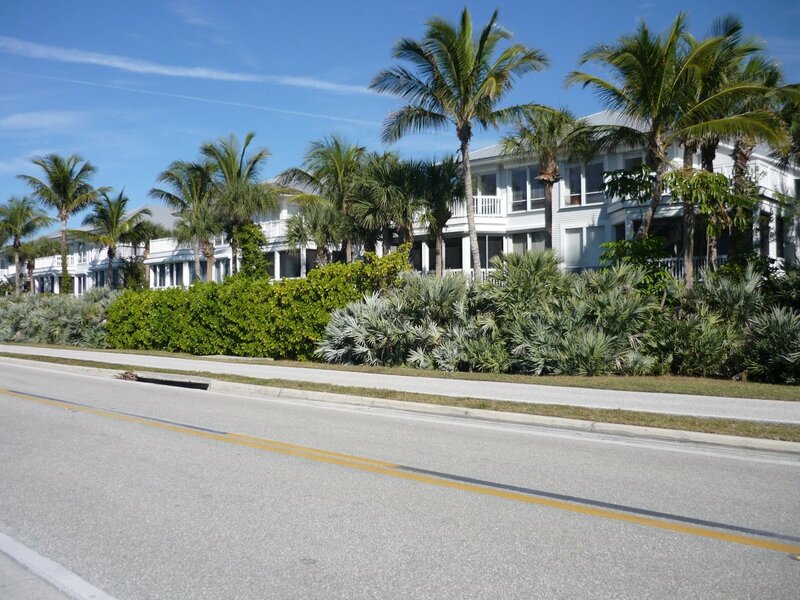 For the most part, aside from a few modern motels, the Gasparilla Inn and assorted Bed and Breakfast establishments, most visitors make use of the vacation rentals of the condominiums now lining the beach front north and south of the village. But the tourist trade has also fallen off in the past few difficult financial years. The village's permanent population has dropped to under 1,000. The anglers still show up, as do the sun worshipers and snowbirds. What is left is a pretty village, a nice place to visit, picturesque and full of history. I take all my northern visitors there for a day trip. Here are some of the photos from my last visit, December 30, 2009. 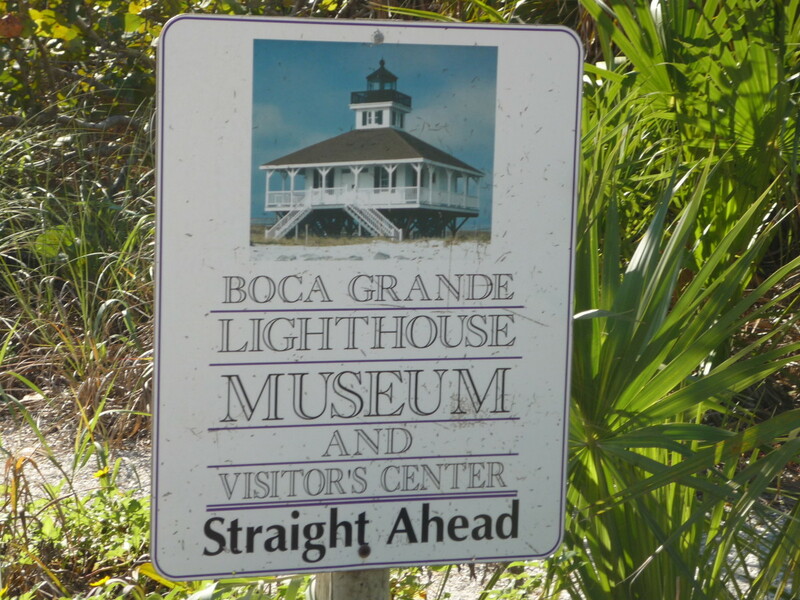 I hope you enjoy them, and should the opportunity ever arise, do visit Boca Grande, and remember her long history. 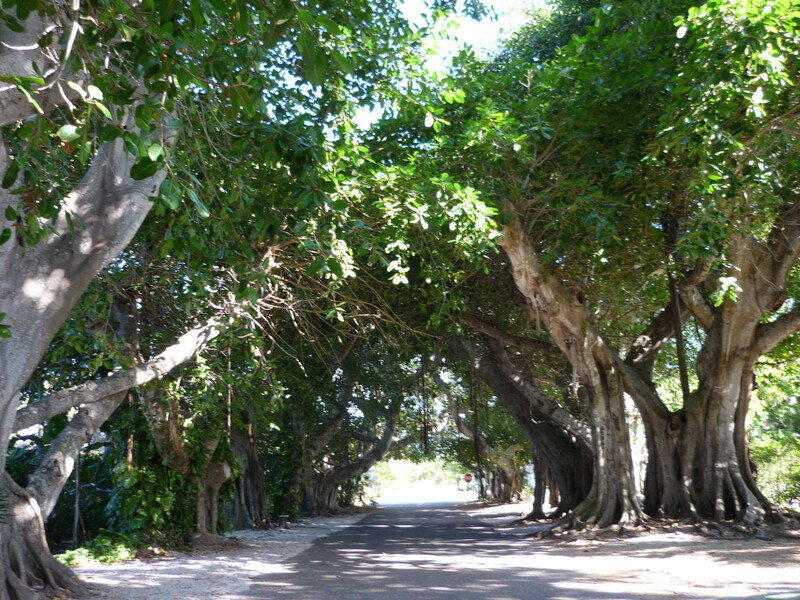 Banyan avenue, appropriately lined with banyan trees. A restored old building, now a bakery and cafe. 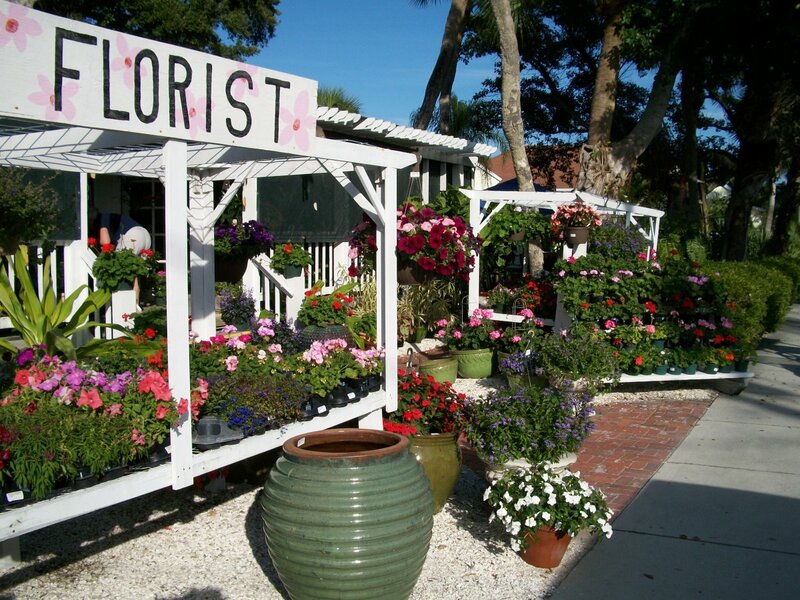 Florist and garden plant center. 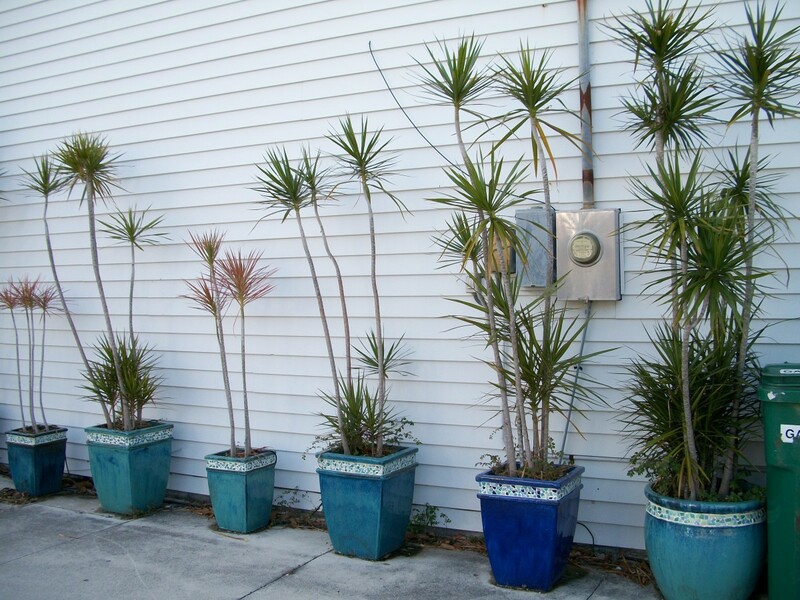 You can't see here, but around the side is a protected orchid house filled with the most beautiful orchid specimens. 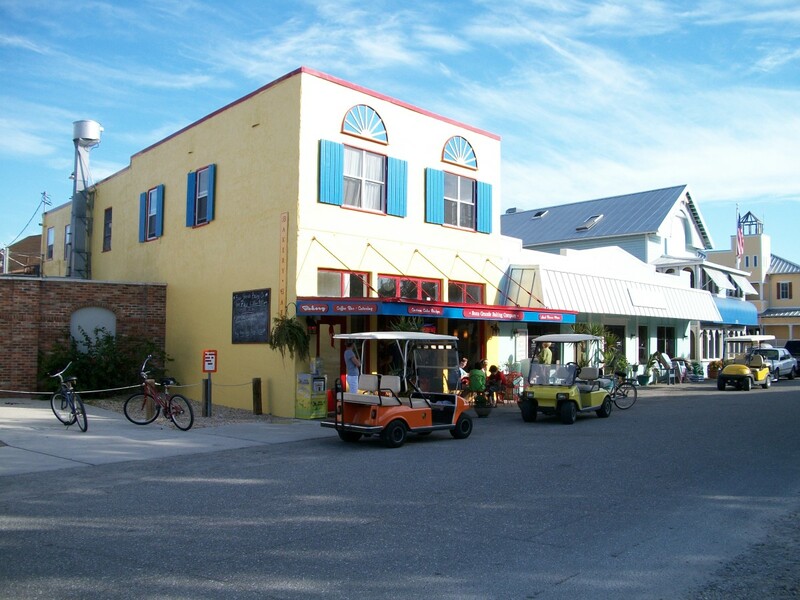 Boca Grande has preserved many of the older buildings. A house built in 1812, now a restaurant. Another storefront. Note the golf cart -- many here eschew cars and use golf carts for everyday travel. Visitors can rent them. This eccentric display begged for a photograph. This appealed to my artistic side. 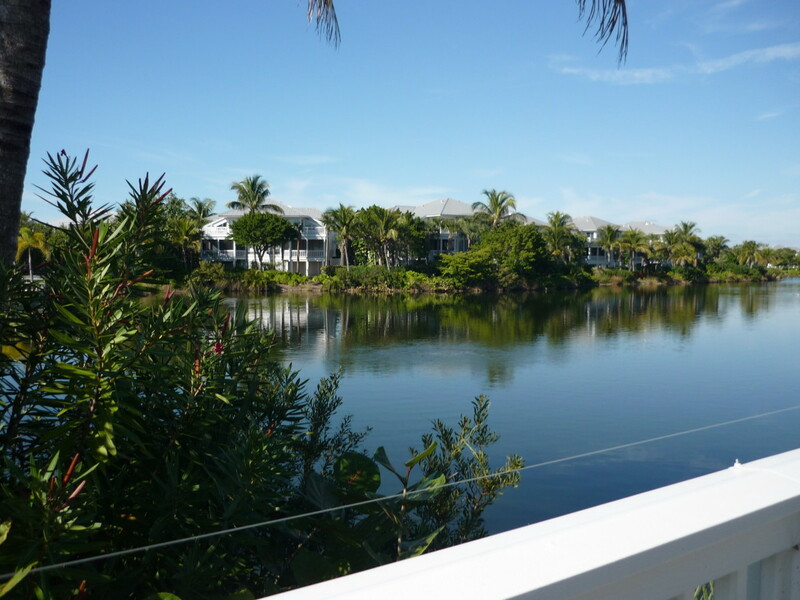 Luxury condos -- seasonal vacation homes on the lagoon. Got a fat checking account? -- many are for sale. Vacation condos now line the road both north and south of the village. A symptom of the times -- lots of units for sale, signs marked "price reduced." The skeleton of the old Florida Power and Light pier -- now a favorite roosting spot for hundreds of pelicans and other sea birds. Can you see them? -- those dots on top. My favorite place to eat, The South Beach Restaurant, right on the beach and doing the best grilled tuna anywhere. Yum. After dinner, a beautiful sunset and time to go home. Lucky we're only thirty minutes from our house. Good night. Possibly one of the most beautiful photographs on any Chamber of Commerce site. 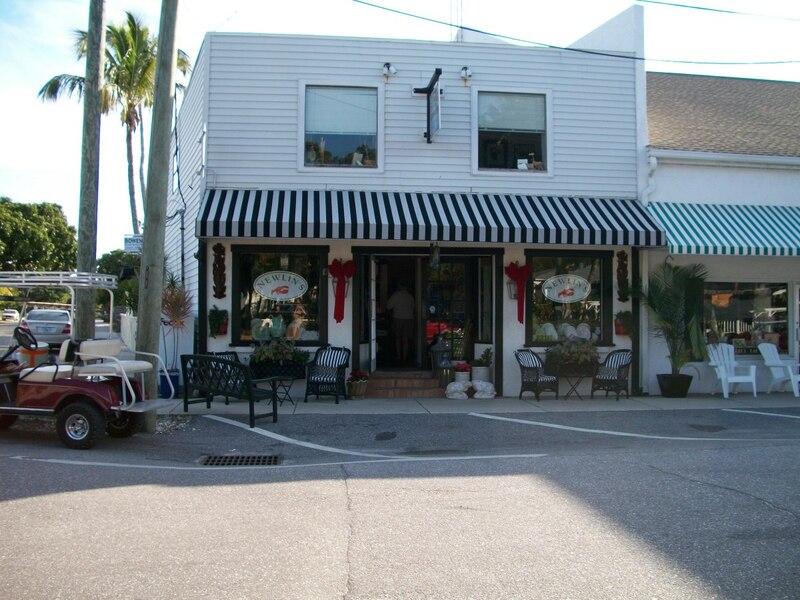 Check here for information on Boca Grande businesses. 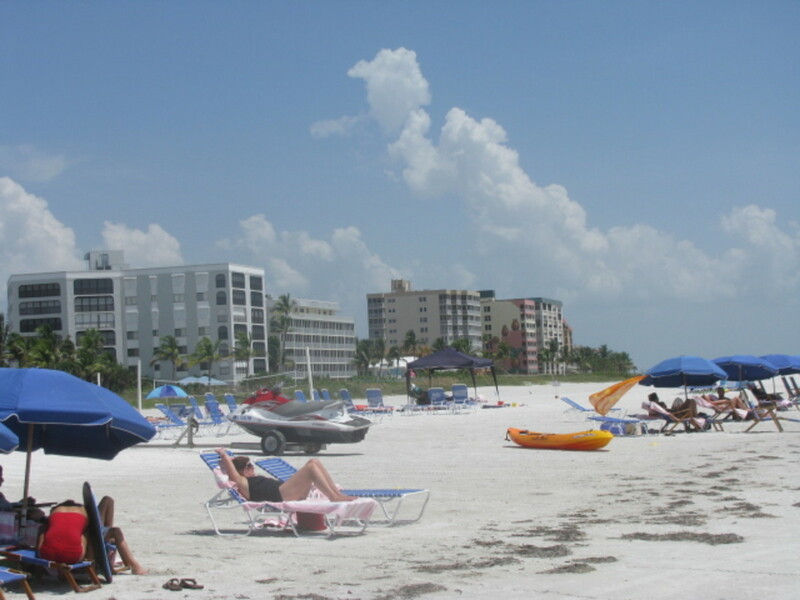 Compare discount rates for Boca Grande, Florida FL hotels and motels. 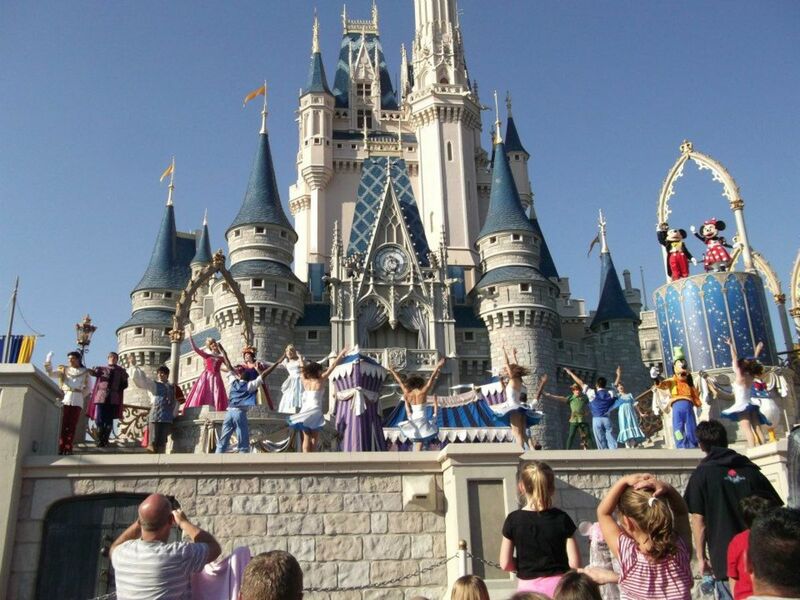 Plus hotel reviews, NO booking fees, few advance payments, and group travel reservations. Florida's history in brief -- an excellent resource site. this was for school and this website was help!!!!!!!! Hi Lynda, I'm in Orlando. 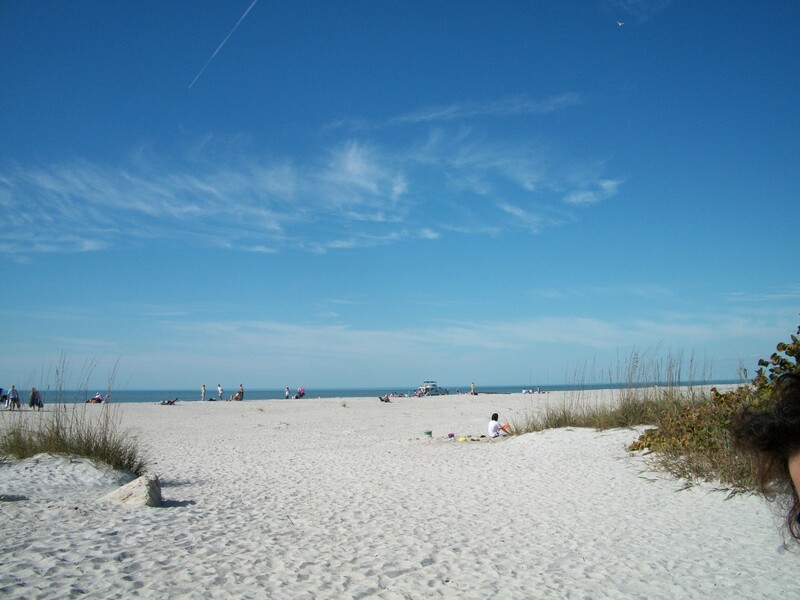 My boyfriend and I have tried since October to do day or weekend trips to the west coast in our scant moments of spare time; we've done Sanibel, Fort Myers Beach, Clearwater and Dunedin so far, but I've actually had my eye on Gasparilla Island for awhile. He and I love to explore, so I'd bet we will run into each other. Looking forward to it! Great writing style and beautiful photos (who says you're not an expert?) I think I'm in love with the Our Lady of Mercy mission church, and thankfully, I'm only a 3 hour drive away! 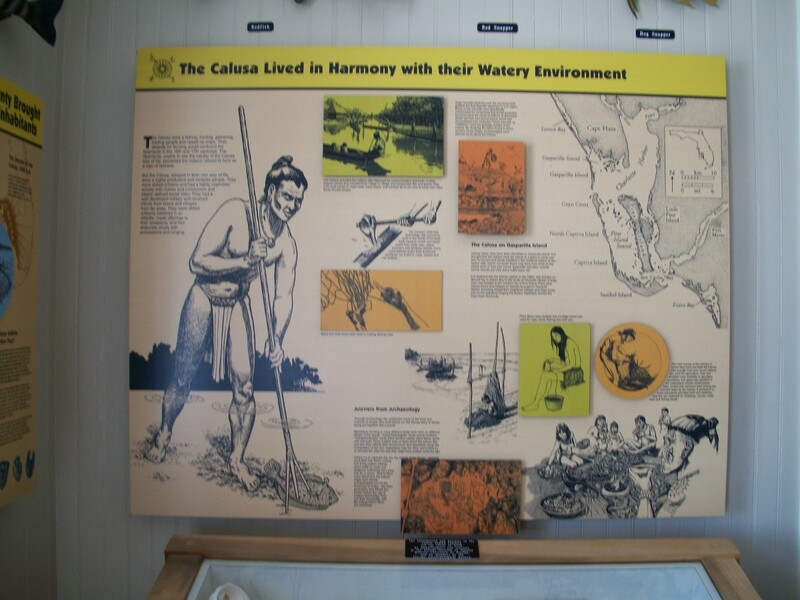 I'll stay for the history, too, especially the charming town and artifacts of the Calusa people. Fascinating stuff! Much of the information used here came from the Boca Grande Historical Society, the State Archives, etc; "with that said," I shall be gracious enough to say thanks for the invite (however left-handed the opening compliment.) Interestingly, the historical sites visited, the libraries, the State Archives, the private archives and the museums etc can't seem to agree on the history, often offering contradictory versions of the same events. All in all, I don't imagine historical truth has been much damaged by the general history as offered in this article. 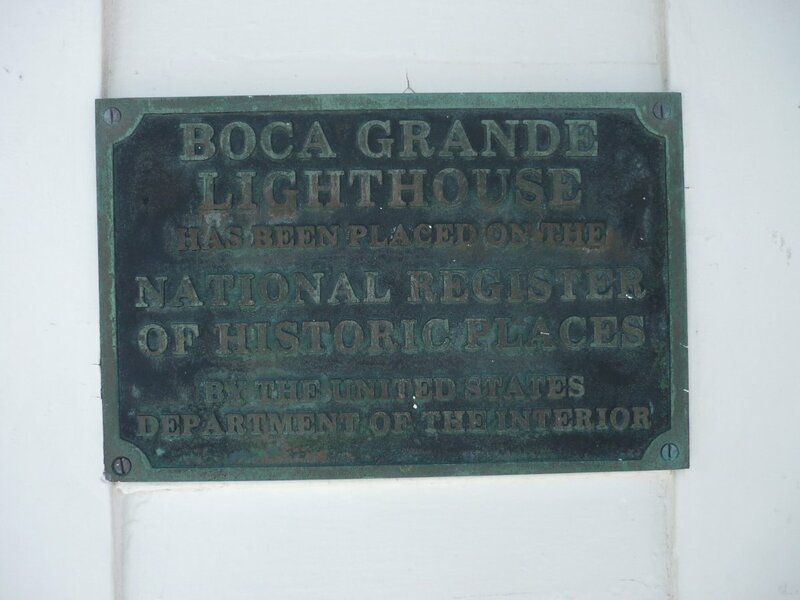 And by the way, I have visited the Boca Grande Historical Society many times -- where do you think I got much of the info and photographs in the first place? Great pictures! 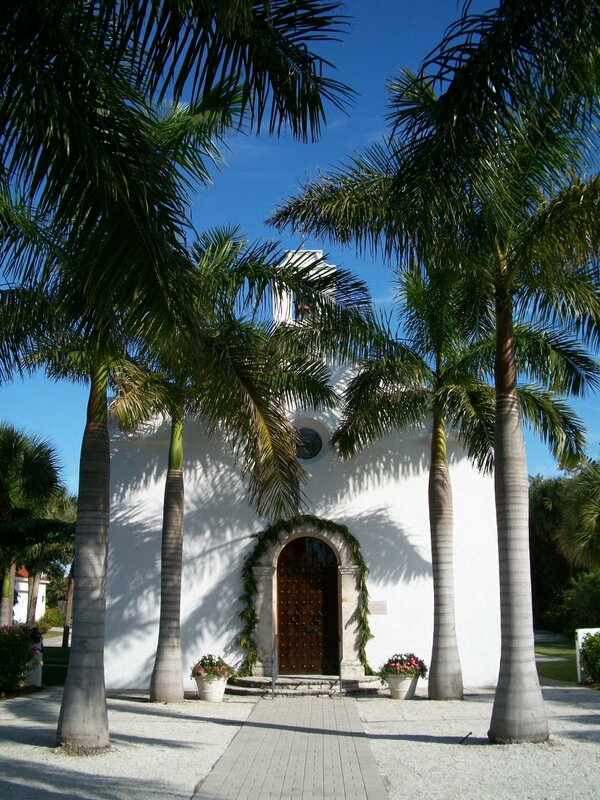 Boca Grande is a very beautiful place to visit. A fantastic experience! Great hub, packed full of such interesting information, beautiful photos and history. I want to pack up and go:) Bookmarking this and thanking you so much for all the work you put into a marvelous article. Pushed every button and an Up! Wow - you make me want to pack up and go right now. Great Hub. We're planning to motorhome to Florida and points beyond. This may now be a destination. Thank you PegCole -- high praise indeed coming from a 'cracker.' Florida has a fascinating history and I hope to write more of it in the future. Lynda, Absolutely awesome pictures and fascinating history. I loved the lighthouse restoration part, the history of the Calusa Indians, the town and beaches, the ferry and the phosphates. Amazing that I lived in Florida much of my life and never knew this stuff. You are incredible in your quest for knowledge. I wish my Dad were still around to share this with him. 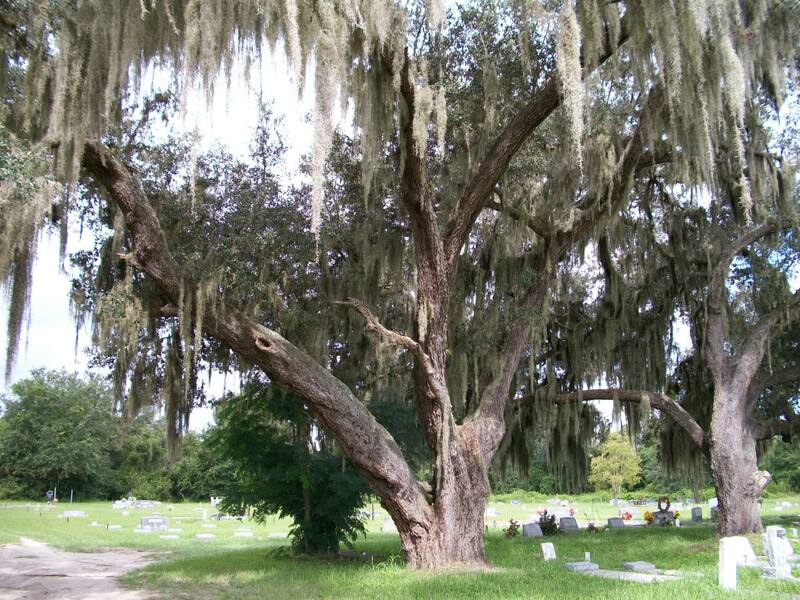 He lived his last few years in LeHigh acres and our ancestors lived all over Florida. I spent some time with his mother's mother, born around 1863, who told stories of the indians who would come into town with their papooses on their backs. Wish I had listened to her with pen in hand. Thanks for an enjoyable read! Thanks Lay Guinevere. I too pray that toxic mess doesn't get this far. My husband, who is from Louisiana is upset at the thought of what is happening in the salt marshes there -- the breeding ground for shrimp, many species of fish and birds. It is sickening. Yes, I too think the life of the Calusa looked idealic. Thanks again for your comment. Florida is such a beautiful state. I lived there for 5 years in North Central Florida in a town called Deltona. Too bad change has to happen. I would have loved to be a fly of the wall with those indigionous peoples. I sure hope the Oil Slick doesn't get that far. Great article too and I will give it a thumbs up. Hi Duchess -- where have you been? Glad you like the piece and yes, the folks at the historical society have seen the article. Thanks for your comment. I've been extremely busy, and constantly interrupted while trying to read this. I kept coming back because it is very interesting, and well written. Great piece of history. Have you sent the link to your friends over at the museum? If you haven't - you should! Yes, a house on the beach sounds lovely -- until hurricane season. Thanks for dropping by and leaving a comment. The sunset picture is beautiful. This is a great article, I enjoyed learned a bit about the history. I would love one of those houses that sits right on the beach. Yes -- the overlooked is always the best. Thanks for the comment. Great hub and gorgeous pics. 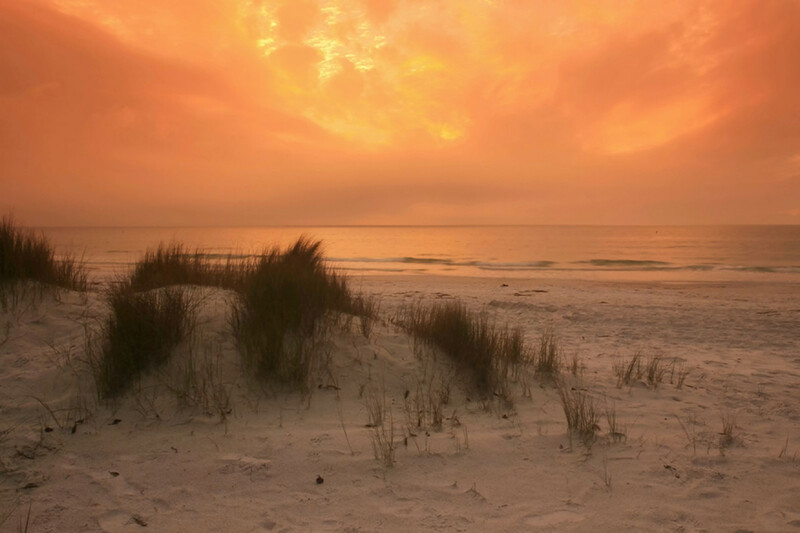 We love Florida's gulf coast! Thank you for this great hub, I live in Tampa Bay and have never been there, just passing nearby on I-75. Got to have a camera when I go. Good thing they preserved the old houses. My parents retired in Lehigh Acres, just west of Fort Myers. It's a shame I didn't know about Boca Grande at the time. Thanks, Lynda, for the tour. The pictures are splendid. Breathtaking and absolutely wonderful, Lynda. I never knew how much I wanted to go to Florida until now! The pictures are so good and one of my favorites is the pink gas pump! Loved this hub a lot! Good job! Look forward to it, miztahcool. Awesome! It reminds me of my hometown. I'll write about it someday so you can have a glimpse of our place. I just need a camera. Gorgeous place. I like to travel to places not that well known. I'm not that much of a people person so I like a nice secluded place and to be with nature. This seems like a good place. 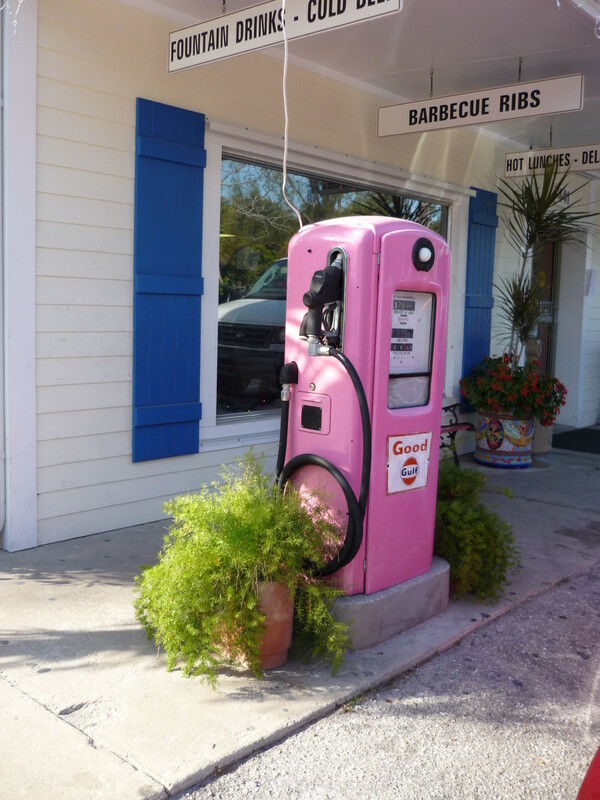 Hi Kartika -- yes, it is a lovely place to spend some time and one of my favorite places pink gas pump and all. 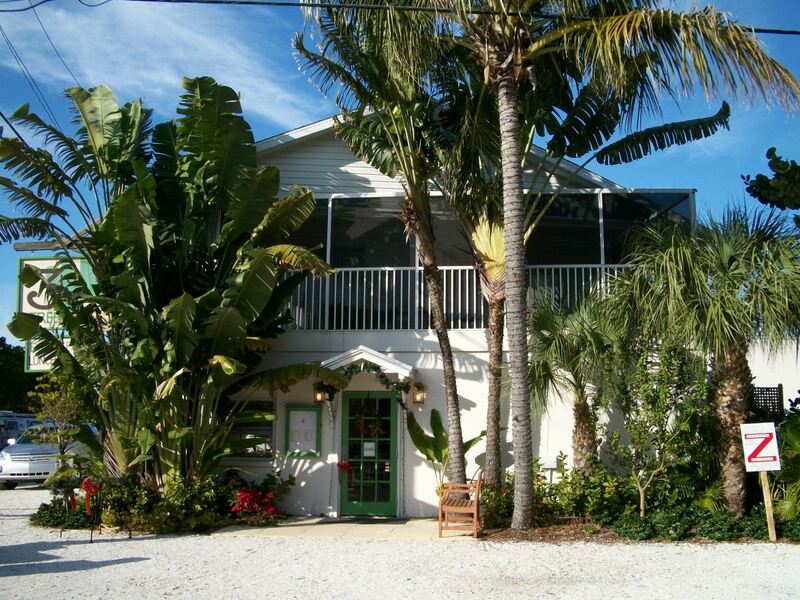 Hello yensid,you certainly won't regret adding Boca Grande to your list. Hi mochiliero -- The Gulf coast of Florida is a well kept secret, and yes, it is a lovely place. I couldn't wait to get home before now trying for an opportunity to leave early. Thanks for reminding me why I need to be there. In addition to missing you very much. I knew nothing about the western coast of Florida. Looks a lovely place! Thanks for sharing. This is a great hub, Lynda. I swear, there's enough in here for its own website! 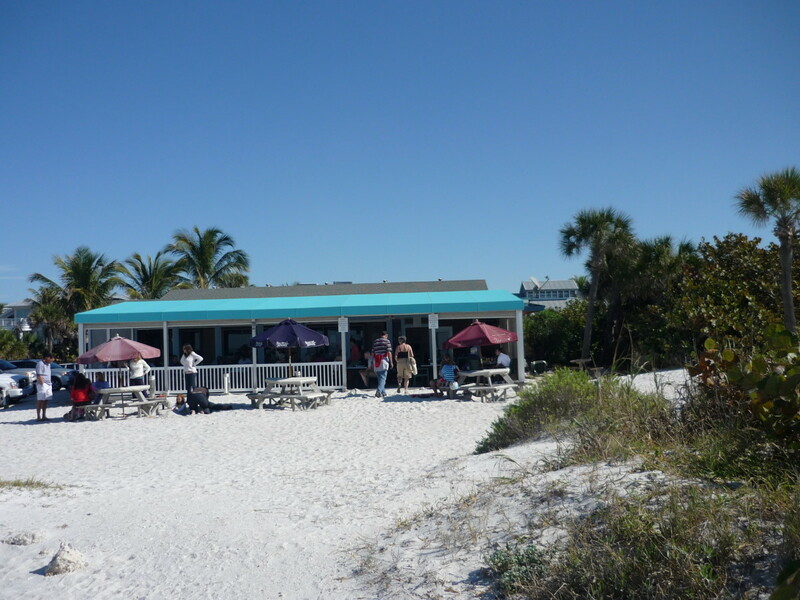 I learned a lot and Boca Grande is now on my list of places to visit in Florida. Hello, Lynda, and thank you so much for such an enjoyable and interesting hub. You showed us a most beautiful place and the history lesson was great. You are a fine writer. Flights to Florida are cheap, and I have a guest room. Really fascinating and beautiful.The history of the island is very interesting. It just amazes me when I hear of these places I never knew existed.What a treasure-lucky you living so near it.Boy I would love to go there. Thanks BkCreative -- yes -- Boca Grande is one of those places you either know about or never hear of. And it's so close to me!! Please feel free to use this for your students, and if you want any further information -- I used only a small percentage of what I dug up. I agree with you, we tend to think of the indigenous people as ignorant barbarians, uncultured and uncivilized, a view Hollywood has done much to create and foster. In truth, there were many nations here long before Columbus was out of diapers, and each had a culture. Well, this is just amazing Immartin! This is the type of hub I can pack up and share with my students (I sub once in a while). I am so glad you included the Calusa people. There is a tendency to discuss history on this continent as if life began 200-400 years ago - totally eliminating the more than 10,000 years of history of the first known people. As an educator I cannot in good conscience ignore facts - it makes our students the dumbest on earth. This is a spectacular place - I didn't even know it existed and I've been around...like forever. Loved the banyan trees - and loved the pelican (dots) and everything else. Thanks for a hub - with everything. Wow! Bookmarked! Rate Up! Yay! Thank you, Quill. Yes, over the years I've come to love Florida as my second home, a special place. Excellent HIUb and I can see why you spend your winter months there in comparison to here...enjoyed the history...well done as always. Yes, very beautiful and I consider it the best part of the state -- laid back, not over built, and just redneck enough to make me feel at home. Thanks for your comment. Great hub! We don't hear much about the western coast of Florida. It is an eyefull!